Seawater Desalination System - SWRO Systems | Applied Membranes Inc. Designed to convert seawater to drinking water, these seawater desalination systems use high quality SWRO reverse osmosis seawater desalination membranes. These systems use our proven technology to give reliable performance and meet the demanding requirements of the marine environment. 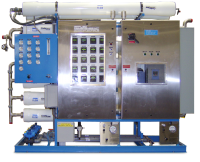 From Watermakers to industrial sized, we offer a full range of both standard and custom engineered Seawater Desalination Reverse Osmosis Systems for applications ranging from yachts, cruise ships, boats to municipalities, hotels, resorts, military, off-shore platforms, and various industrial applications. Please select a series below to view the system to meet your needs. Maritime Series Watermakers convert seawater to drinking water. Their compact design makes them ideal for use on yachts, boats, cruise ships, and resorts. Voyager Watermakers are sold in several modules which can be installed into smaller spaces and connected together for applications with limited space. AMI SY Series Small Commercial Seawater RO Systems desalinate seawater for use in pilot testing, small commercial and industrial applications. AMI Seawater RO Systems convert seawater to drinking water for municipal, hotels, resorts, military, off-shore platforms and industrial applications. Seawater Desalination Reverse Osmosis Systems custom engineered with Energy Recovery, Data Logging, Containerized, Explosion Proof, Portable and more.